While stage managing the American empire has undoubtedly proved to be a more difficult task now than in the bipolar world of the cold war era, it is not for lack of greed or hubris that the Kagans and others continue to sell their vision. Did they create these ideas because they truly believe in America's right to be the dominant force in the world? Or, do these ideas help sell weapons and control resources like oil and rare minerals? 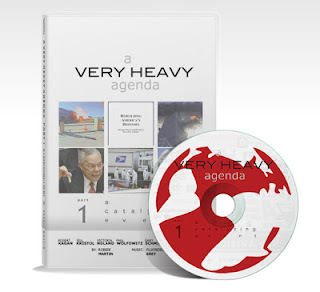 Part 3 shows interview footage of an obscure PNAC member (Thomas Donnelly) taking credit for the ominous “New Pearl Harbor” phrasing in the notorious 'Rebuilding America’s Defenses' document. But the evidence shows the genesis of the concept to be patriarch Don Kagan, in conjunction with his son Fred, in prior writings that call for ‘a catalyzing event’. Other newly sourced footage shows the pair advocating for a US military ground invasion of Palestine on September 12th, 2001 and displaying an unnerving prescience about the 9/11 attacks and subsequent anthrax letter attacks. I have the boxed set of DVD's. If memory serves, the whole thing is over six hours in length. I was looking for something to watch tonight. I guess this is it.